San Jose de Chiquitos (also known as San José de los Boros) was established in 1698 under the supervision of Friars Felipe Suárez and Dionisio Avila and is the only one of the that is built from stone. Other missions built their columns, pillars, and buttresses from ornately carved wood, but due to the lack of trees in this area, the church and entire mission complex are made mainly from stone and plaster. San José de Chiquitos is located about 230 kilometers East of the city of Santa Cruz, in Southeastern Bolivia, along the rail line and regular highway that run parallel to each other all the way East through Roboré and on to Puerto Suárez on the border with Brazil. This is one of the most beautiful areas in Bolivia. Today this is a largely commercial town as it is located along the railroad that leads from the city of Santa Cruz to Puerto Suarez, a town on the border with Brazil. Here you can go to the Santa Cruz la Vieja park (the site where the city of Santa Cruz was originally founded). It was later moved to its present position many miles away to its current location. You can also take a bus from Santa Cruz. This is also an important cattle ranching region of Bolivia. 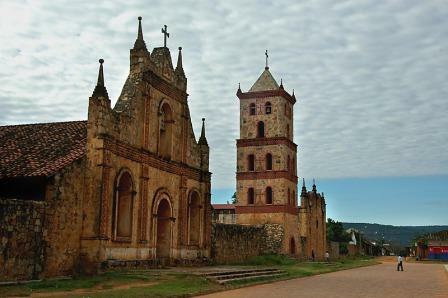 San José de Chiquitos participates in the International Baroque Music Festival that takes place every two years. Check the "tourist attractions" pages, the "how to get there" and the "where to eat" pages (links above) for more on the many things to visit in San José de Chiquitos. Geoffrey A.P. Groesbeck has dedicated many years, clearly much love, and an entire website to this unique region of Bolivia. I strongly urge you to view Mr. Groesbeck's website as it is THE most complete resource you will find on Bolivia's Jesuit Missions.